The first time I tried to make soup from scratch, I warmed some chicken broth from a carton, then threw in chopped carrots, peas, green beans and precooked alphabet pasta. I think I may have sprinkled grated parmesan cheese on top. It was better than soup from a can, but it wasn’t very good. My kids ate it — they’ll pretty much eat anything that involves pasta — but I knew I could do better. Luckily for me, Abbey Duke — Sugarsnap owner and Burlington Children's Space parent extraordinaire — offered to bring me into her prep kitchen and teach me a few tricks of the trade. That’s where I learned about the magic of mirepoix, the French technique of cooking down finely chopped onion, celery, carrots and sometimes aromatic herbs to start a soup or stew. She also introduced me to the idea of slowly simmering veggies in broth or water and pureeing them with butter and cream. After my session with Abbey, I felt much more confident in my soup-making skills and started brainstorming great soups I'd had in the past that I could try to recreate. 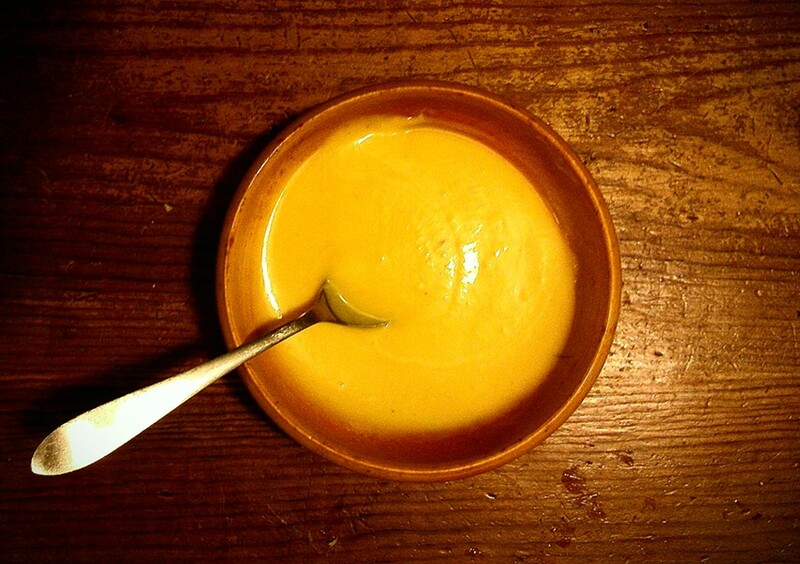 Over the years I’ve tasted various spins on a beautifully colored, slightly spicy butternut squash soup. I decided that making my own version would be a good place to start. I initially made this soup for a family dinner at the Children's Space — the first soup I'd ever made on a large scale. It’s smooth, creamy and can be mild or spicy to please kids and adults alike. My own kids and the BCS kids love it, and it’s become a go-to menu item for fall dinners at the school. It's simple enough to make for dinner on a work night, yet it still makes you feel like a really good cook. Whenever I make it at the Children's Space, folks invariably wander into the kitchen to ask what smells so good! I like to serve it with biscuits or — my absolute favorite — grilled cheese sandwiches, made on really good bread with lots of butter. This makes enough for 5 to 6 people, but the recipe can be doubled, or even tripled, if you’re feeding a crowd. It freezes well and reheats beautifully. Heat the coconut oil in a large dutch oven or heavy-bottomed pot over medium heat for a few minutes. When it’s nice and hot, add the chopped squash and onion and cook, stirring often for 4 to 5 minutes, until everything is coated in oil and the onion is starting to smell good and turn translucent. Add the coconut water, making sure it covers the veggies. 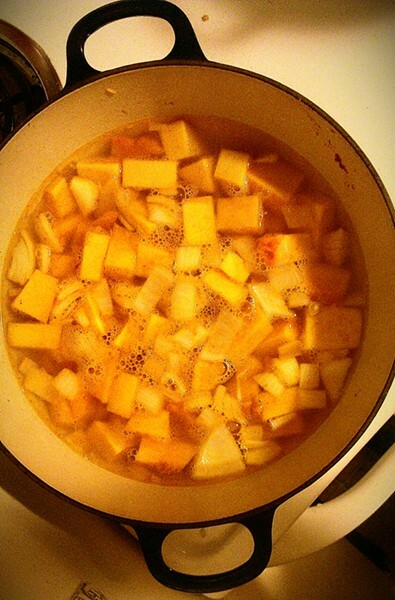 Cover the pot, reduce heat to medium low and simmer for about 30 minutes until the squash is very tender. You should be able to easily break the pieces apart with a wooden spoon. Add the salt and curry powder. Remove from the heat. Now it’s time to puree! You can use an immersion blender right in the pot, or transfer the soup in batches to a blender or food processor. When it’s all smooth, add the cream and blend a bit more. If you’ve used the blender or food processor, transfer the soup back to the pot and add some black pepper to taste.